Q1. Identify one criterion to help determine a subnet mask for classful addressing when designing a network-addressing scheme. How many networks are there in the network? How many hosts are there on the largest subnet? Q2. Which command is used to forward broadcast traffic across a router to a particular destination? Answer: The command used to forward broadcast traffic across a router is the ip helperaddress. Q3. With a classless address of 204.1.64.0/20, what is the range of classful addresses that are included in the address? Write your answer in dotted decimal and the third octet in binary notation. Answer: The address 204.1.64.0 /20 includes the Class C addresses 204.1.64.0 to 204.1.79.0; this is illustrated in both dotted decimal and binary notation in the following table. Q4. What is a discontiguous network? Answer: A discontiguous network is a network in which a NIC address is separated by another NIC address. Therefore, the original NIC address is no longer contiguous because an intervening NIC number has interrupted it. Q5. For VLSM to be available as a design option in the network, what characteristic must the routing protocol possess? Answer: The routing protocol must send the prefix or subnet mask as part of the routing update. Q6. If summarization is to be implemented in the network, name one design criterion for the addressing scheme that must be in place? Answer: For VLSM to work, the addressing scheme must be hierarchical, allowing the upstream devices to share the same high-order bits as the downstream devices. Q7. What networks are provided in RFC 1918, and what prefix mask accompanies each network? Q8. If the host portion of a subnet has been used to identify end devices, can that subnet be used again for VLSM? Answer: It is not possible to use a subnet for addressing hosts as well as using it to further subnet the network using VLSM. The addresses would be seen as duplicate addresses. Q9. Describe the purpose of the ip forward-protocol command. Answer: The ip forward-protocol command is used to identify which protocols should be forwarded in reference to the IP helper address. Q10. Which command is used on point-to-point lines to conserve IP address space? Answer: The command used is IP unnumbered, and it prevents the use of a subnet of a serial link, which is unnecessary. Q11. Give one example of when route summarization would not be a good solution. There are discontiguous networks in the organization. 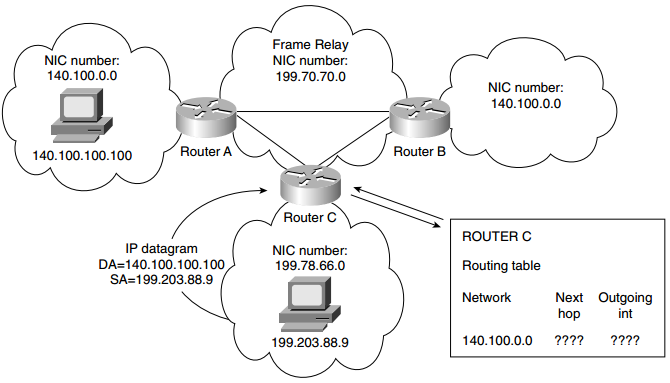 A specific subnet needs to be seen throughout the network. The addressing scheme does not support summarization. No common highorder bits are shared in the network-addressing scheme. Access lists require detailed information. Q12. Give one reason for implementing router summarization. Q13. Given an address of 133.44.0.0 and a prefix mask of /25, how many networks can be addressed, and how many hosts can exist on each network? Write the first and last possible subnets in binary and decimal notation. Answer: For the network address of 133.44.0.0, the subnet mask of 255.255.255.128 would enable you to address 510 subnets with 126 hosts on each subnet. This complies with the subnetting rule of not allocating addresses with all zeros or all ones. The following table illustrates the first and last subnet in their binary and decimal notation formats. Q14. What class of address is 131.188.0.0, and how many hosts can be addressed if no subnetting is used? Answer: 131.188.0.0 is a Class B address and can address more than 65,000 hosts on one network if no subnetting is utilized. Q15. If given a Class C address with the requirement to accommodate 14 subnets and 10 hosts on each subnet, what subnet mask would you use? Answer: The mask is 255.255.255.240, or the prefix mask of /28. Q16. List the range of hosts available on the 136.122.10.192/28 subnet. Answer: The range of hosts available on the subnet 136.122.10.192 /28 is 136.122.10.193 to 206. Q17. Convert the subnet address 56.98.5.0/24 to binary notation, and state the class to which it belongs. Q18. Write out the decimal notation of the following subnet mask presented in the binary notation of 11111111.11111111.11111111.11111000. Q19. What does VLSM stand for? Answer: VLSM stands for variable-length subnet mask. Q20. The Class B network address of 133.222.0.0 has been given a mask of 255.255.255.0. The subnets 133.222.8.0, 133.222.9.0, 133.222.10.0, 133.222.11.0, 133.222.12.0, Answer: 133.222.13.0, and 133.222.14.0 need to be summarized using VLSM. Give the subnet and new mask to achieve this summarization. Answer: The subnet would be 133.222.8.0 with a mask of 255.255.248.0, or /21. Q21. Is 201.111.16.0/20 a valid subnet mask? Answer: Yes, this is a valid mask, and it will provide 16 consecutive Class C addresses to the organization. Q22. Which routing protocols support VLSM? Answer: RIPv2, OSPF, IS-IS, EIGRP, and BGP-4 support VLSM. Q23. Briefly define route summarization. Answer: Route summarization is the method of including many subnets in a few routing entries. Q24. What sort of design scheme does route summarization require? Answer: Route summarization requires a hierarchical addressing scheme. Q25. In route summarization, where is the subnet mask moved? Answer: In route summarization, the subnet mask is moved to the left. Q26. How does summarization allow for smaller routing tables? Answer: Summarizing is the consolidation of multiple routes into a single advertisement. Q27. Identify two private addresses defined in RFC 1918. Q28. What is a discontiguous network? Answer: A discontiguous network is a network in which a NIC number is bisected by another NIC number. Q29. What does CIDR stand for? Answer: CIDR stands for classless interdomain routing. Q30. Which RFC is responsible for first describing the use of subnet masking? Answer: RFC 950 is responsible for this.